St. Paul, Minn., April 22, 2016 – PolyMet Mining Corp. TSX: POM; NYSE MKT: PLM – today reported that it has filed its financial results for the year ended January 31, 2016. PolyMet controls 100 percent of the development-stage NorthMet copper-nickel-precious metals ore body and the nearby Erie Plant, located near Hoyt Lakes in the established mining district of the Mesabi Iron Range in northeastern Minnesota. On November 6, 2015, the Minnesota Department of Natural Resources reported that the NorthMet Final Environmental Impact Statement had been completed. The Final EIS was subsequently posted in the Federal Register and the Minnesota Environmental Quality Board Monitor. Completion of the Final EIS is the culmination of more than a decade of detailed analysis and thorough review from various state and federal regulatory agencies. The Final EIS indicates that the proposed project meets human health and environmental standards. On November 16, 2015, the U.S. Forest Service published its Draft Record of Decision recommending the proposed land exchange in which PolyMet would receive surface rights in exchange for transferring land it currently owns to the Superior National Forest. The Draft ROD recognizes that the proposed land exchange would be beneficial to the Forest Service and would be in the public interest. On March 3, 2016, the state determined that the Final EIS addresses the objectives defined in the EIS scoping review, meets procedural requirements, and responds appropriately to public comments. The 30-day period allowed by law to challenge the state’s decision has passed without any legal challenge being filed. On April 19, 2016, the DNR, in partnership with the Pollution Control Agency and the Department of Health, held a Pre-application Public Informational Meeting that included an overview of the NorthMet Project and the permit to mine process together with a summary of other state permits such as tailings dam safety, water quality, air quality, and wetlands, that will be required to construct and operate the project.The DNR laid out the process for the permit to mine, comprising: pre-application consultation; submission of formal applications that will be posted on the project website (www.mn.gov/polymet); formal regulatory review; publication of draft permit with an opportunity for public comment; and issuance of permits.The pre-application consultation is underway and is intended to help PolyMet craft the formal permit applications in order to help the regulatory agencies expedite the review process. The DNR stated that the timeline for completion will be better defined once it has received the formal applications. The Company issued $33.0 million secured debentures to Glencore AG, a wholly owned subsidiary of Glencore plc, to fund environmental review, permitting and general corporate purposes; extended the Glencore convertible and non-convertible loans to March 31, 2017; clarified PolyMet’s right to repay the loans at any time without penalty; and reset the interest rate to 12-month U.S. dollar LIBOR plus 15.0% from January 1, 2016. Loss for the twelve months ended January 31, 2016, was $9.346 million compared with $7.276 million for the prior year period. General and administrative expenses for the twelve months ended January 31, 2016 were $5.508 million compared with $5.489 million for the prior year period. As a result of a one-time non-cash loss on the disposal of wetland credit intangibles, other expenses were $3.838 million compared with $1.787 million for the prior year period. 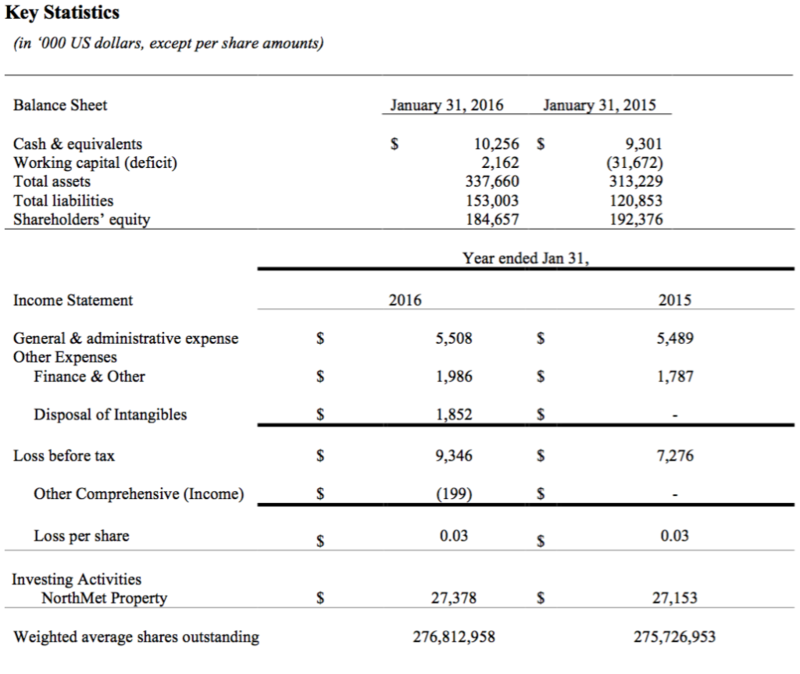 At January 31, 2016, PolyMet had cash of $10.256 million compared with $9.301 million at January 31, 2015. Short-term debt totaled $4.962 million due to the Iron Range Resources and Rehabilitation Board, secured by land that forms part of the proposed land exchange with the U.S. Forest Service. PolyMet invested $27.378 million cash into its NorthMet Project during the twelve months ended January 31, 2016, compared with $27.153 million in the prior year period. As of January 31, 2016, PolyMet had spent $102.160 million on environmental review and permitting, of which $95.709 million has been spent since the NorthMet Project moved from exploration to development stage. Specific reference is made to PolyMet’s most recent Annual Report on Form 20-F for the fiscal year ended January 31, 2015 and in our other filings with Canadian securities authorities and the U.S. Securities and Exchange Commission for a discussion of some of the risk factors and other considerations underlying forward-looking statements.